Slide to Safety is an effective alternative means of rapid evacuation in emergency situations. Evacuating the residents of a building during a dangerous situation is the primary concern of first respondents. Whether it’s a fire outbreak, a gas leak or an active shooting, the major priority is to ensure the people are safe while trying to neutralize the danger. Emergency exits in buildings prove to be inadequate in these situations. During chaotic moments, these exits are often overcrowded or out of reach. 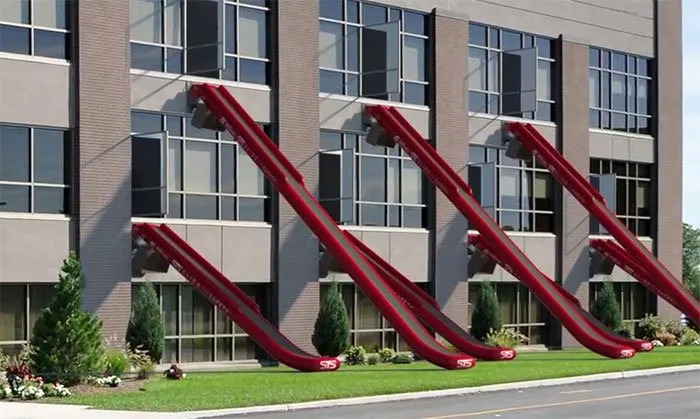 Slide to Safety is a revolutionary Rapid Evacuation System that serves as an effective alternative means of evacuation for buildings with multiple stories. The STS was created to cater to all forms of contingencies. Loss of power is a common occurrence during emergency situations. The STS is non-electrical; this ensures people can still be safely evacuated when there is a power failure. The slide is attached to the windows of the second to fourth floors of a multi-story building. Essentially, every window with an STS serves as an emergency exit. The STS further comes with telescoping stairs that makes it easy for children as well as the elderly to have access to the window exits. The stairs fold inside when it is not in use and pops out when the system is activated. This technology ensures the stairs occupy limited space in the room, while also ensuring they do not hinder free movement. The STS system is deployed using compressed air canisters that work seamlessly with a proprietary inflation system. This state-of-the-art inflation system has been saving lives in the aviation industry for many years. However, the STS expands the possibilities, making it useful for various purposes. Slide to Safety either makes use of Pull handle activation or Push handle activation technology. Once the handle is pulled or pushed as appropriate, the slide pops out and it is fully inflated in less than 6 seconds. Once it’s inflated, everyone that would otherwise have been trapped in the building can slide to safety. The slide is applicable for second, third, and fourth floors of all types of multi-story buildings. It can effectively evacuate about 30 people under one minute. The STS may be installed on residential, commercial, or educational buildings and other buildings with more than one floor. Whether the traditional egress is blocked or still available, Slide to Safety provides an alternative means of evacuation during emergencies. The STS can only be installed by certified engineers from the manufacturing company. They would assess your building and determine the specification of the slides needed. Once this is done, they would provide a custom quote and prepare for the installation. A comprehensive safety training would be organized after the installation. You can visit the STS official website to request for a custom quote.